When five-year-old Kampol is told by his father to wait for him in front of some run-down apartment buildings, the confused boy does as told--he waits, and waits, and waits, until he realizes his father isn't coming back anytime soon. Adopted by the community, Kampol is soon being raised by figures like Chong the shopkeeper, who rents out calls on his telephone and goes into debt while extending his customers endless credit. Kampol also plays with local kids like Noi, whose shirt is so worn that it rips right in half, and the sweet, deceptively cute toddler Penporn. 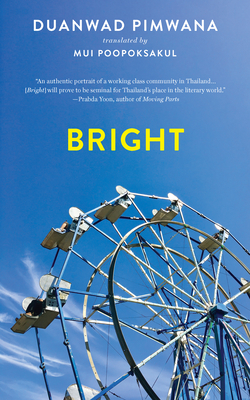 Dueling flea markets, a search for a ten-baht coin lost in the sands of a beach, pet crickets that get eaten for dinner, bouncy ball fads in school, and loneliness so merciless that it kills a boy's appetite all combine into Bright, the first-ever novel by a Thai woman to appear in English translation. Duanwad Pimwana's urban, and at times gritty, vignettes are balanced with a folk-tale-like feel and a charmingly wry sense of humor. Together, these intensely concentrated, minimalist gems combine into an off-beat, highly satisfying coming-of-age story of a very memorable young boy and the age-old legends, practices, and personalities that raise him. Pimjai Juklin, whose pen name is Duanwad Pimwana, won the S.E.A. Write Award in 2003 for her novel Bright after making her name on the local literary circuit as a short-story writer. Pimwana is one of only six women to have won the Thai section of the S.E.A. Write in its thirty-seven-year history. Known for fusing touches of magic realism with social realism, she has penned nine books, including a novella and collections of short stories, poetry, and cross-genre writing, and she is currently working on a political novel. Mui Poopoksakul is the translator of Prabda Yoon's The Sad Part Was and Moving Parts, both from Tilted Axis Press. Her work has also appeared in various literary journals, including Two Lines, Asymptote, The Quarterly Conversation, and In Other Words.